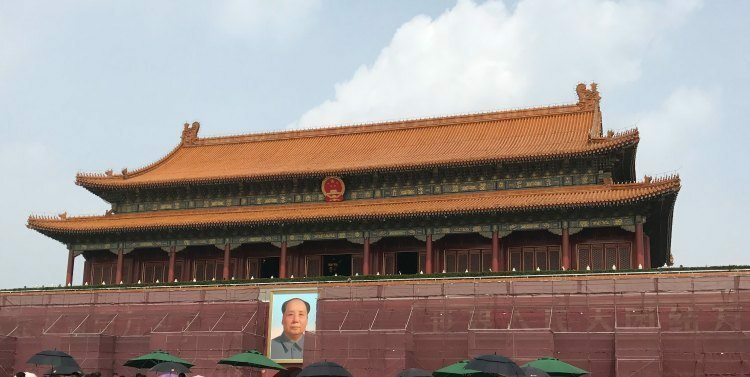 » Our First Day in Beijing – Sightseeing Highlights and Rip Offs! While on the positive side we had some very enjoyable meals in a local restaurant and going to the Great Wall at Mutianyu. After catching the Airport Express train into town and then taking a short taxi ride that started with just a small rip off we arrived at the hotel at about 8 in the morning! I noticed that the driver turned the meter off when the fare read 21.90 Yuan. When I asked him about it he said that the fare would be 40 Yuan. So a a rip-off overcharge of 10 or so Yuan started the day. We had been warned that Beijing taxis have the reputation of ripping off foreigners by not turning on the meter and then charging an exorbitant fee. 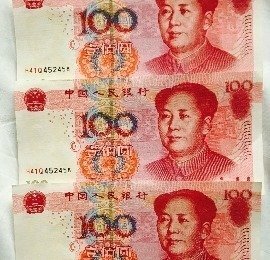 We later learned that they are also known for passing off fake 100 Yuan notes to unsuspecting passengers. On arriving at the hotel I could not find my phone which for me was a catastrophe (drama queen!!). After frantic but fruitless calls to the taxi company, wandering up and down the pavement and activating the lost phone facility on my computer I was resigned to the fact it might have gone forever. But on getting to the room and sorting out my travel bag … there was my phone. I’d forgotten that before getting out of the taxi I’d put it in my bag. This “lost phone” drama was followed by a red face and apologies. After a very long day starting at 4am (when we were woken up to prepare for landing … over an hour before we landed!! ), a hot day of walking, sunburned and weary we decided to take a taxi back to the hotel. Beijing Taxi Ride … Ripoff? After getting into this taxi the driver didn’t turn on the meter and when questioned he said the fare would be 40 Yuan. Knowing that this was exorbitant we negotiated it down to 30 Yuan … which was still way in excess of a metered ride. But we were tired and hungry and just wanted to get back to the hotel. What followed was a hectic drive. Sometimes on the wrong side of the road and at one point the driver throwing 70 Yuan across to Roger who was sitting in the front passenger seat. Roger assumed that he was implying that he wanted to be paid with a 100 Yuan note. So Roger handed him one. The driver gesticulated wildly waving his arm towards the upper right of the windscreen shouting something like “Beijing money, Beijing money, Beijing money” and handed the note back to Roger demanding another note. After taking this note the arm waving and “Beijing” babble was repeated as he tossed it back to Roger. He then asked me (sitting behind him) for a 100 Yuan note. I handed one to him and it again triggered a wild bout of gesticulating and shouting “Beijing money, Beijing money, Beijing money”. We were baffled and were rather concerned when he told us to get out of the taxi without paying. Fortunately, we had a map and we slowly made our way towards Tiananmen Square and home. After an enjoyable supper we went to the hotel shop to pay for excursion tickets for our trip to the Great Wall. As the cashier received the 100 Yuan notes she handed some back with the simple response “bad”. "What?" we exclaimed. Speaking into her phone with Google translate came the gut sinking response “these notes are fake”. Our first conclusion was that we’d got these notes that morning from the ATM at Beijing airport when we arrived from Kuala Lumpur. Both Roger and I had withdrawn 1 000 Yuan from the same machine. Between us we had 1 000 Yuan of worthless paper. We were gob smacked. We knew China was fraught with scams but this was beyond even our South African comprehension. Fake notes in an airport ATM! However, after speaking to some locals they were convinced that we’d been scammed by the taxi driver. While it was obvious that the taxi ride was bizarre it seemed impossible that the driver had managed to convert my 400 Yuan of fake notes. I was sitting in the back seat and all I’d passed him was one 100 Yuan note. Whatever happened we were scammed for 1 000 Yuan on our first day in Beijing. These issues seem to be so matter of fact that tendering fake notes just elicit a simple response "fake" or "no" as the note is handed back. While there are a number of WiFi zones some, like at Starbucks require authentication with a Chinese number!! We found that buying a SIM card in China was a mission. The China Mobile shop in Beijing airport only opens at 8am! Shops in the city with “China Mobile” signs, will top up contracts but don’t sell SIM cards. Even going to the branches of China Mobile and China Unicom when we got to Pingyao was fruitless. The quality of WiFi internet access is generally pretty poor. So getting your own setup is essential. It also makes it easier to get information about the visited sightseeing sites. Fraud and corruption are endemic and as a foreigner you are a prime target. If the driver doesn’t turn on the meter - get out. If the driver stops the meter before the end of the journey - get out. Load up an app like Google or Baidu translate and have a message stating these conditions. Young English speaking tour guides wanting to “help you” it’s really “how I help myself” so just say “no thanks”. Cheap day trips are not worth it as they are a disguised junk shopping trip. Don’t take a rickshaw - at the end of the trip you'll hear comments like “not 3 Yuan 30 Yuan ... you hear wrong! !” You can also end up down an alley with no internet connection and have no idea where to go … not a very strong negotiating position.